My plot at the new community garden is planted! 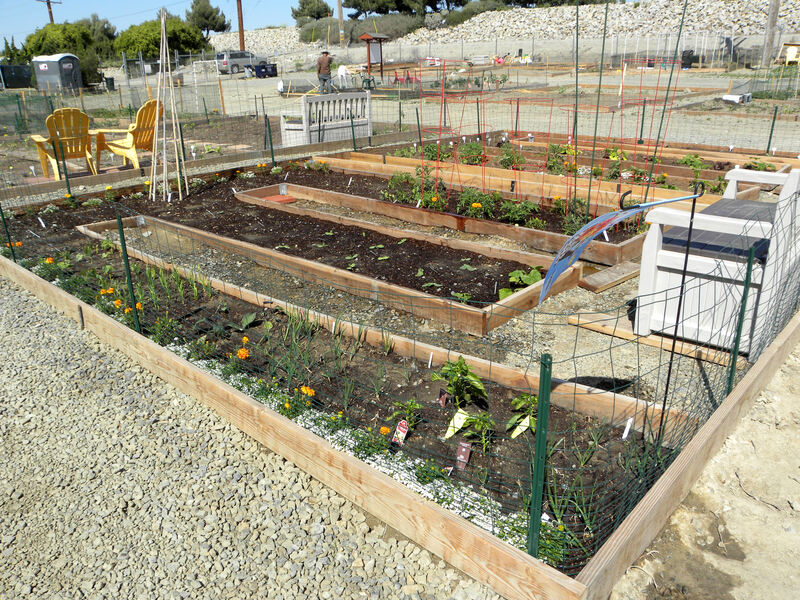 Posted on May 7, 2011	by Lou Murray, Ph.D.
After two years of work getting a new community garden in Huntington Beach, it’s finally open. Most of us have our plots in various stages of completion, with only a few gardens still untouched. I expect to finish my spring planting today with beets and sunflowers. After that, it will be filling in the spots as things come out. Here is what my A-17 plot looks like. My friend Judi is gardening in the plot adjacent to mine. We have no path between our gardens, only a board. I spend a lot of my gardening time sitting on my garden bench. I store fertilizer and tools in the storage compartment under the bench seat. As you can see, I built my raised beds in a pattern resembling the letter E. My plot is 14 ft x 20 ft. It should have been 15×20, but due to a fence not being where it was thought to be, the planners cut a foot off of a few gardens. Mine was one of the ones so chopped. I planted eggplant and bell peppers at first. I came back a few days later to find that bunnies had eaten my eggplant to the ground. 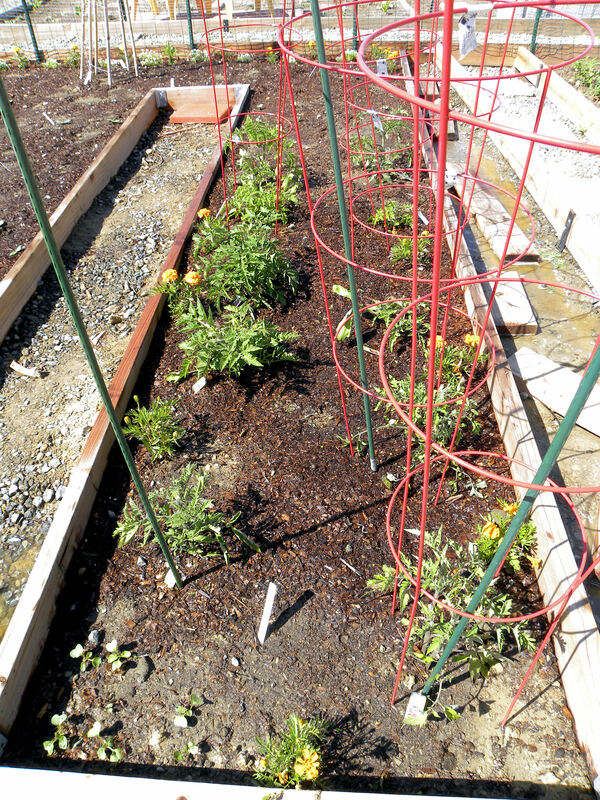 With a very big sigh, I put up a wire bunny fence and replanted. Then Edison told us that we couldn’t have wire under their power lines. My wire was vinyl coated because I knew we couldn’t have exposed metal. I’m still waiting to see if I have to replace it or not. The gravel parking area that I got for my plot was absolutely ungardenable. I built raised beds (and by “I”, I mean my husband), hired a kid to rototill and sift out the rocks inside the beds, then put in hundreds of dollars of soil amendments, mainly compost, redwood compost, and steer manure. I dug most of it in myself with some help from my beloved spouse. After those of us who are attempting to garden over a former parking lot put in raised beds, Edison told us that we couldn’t have raised beds either. They are letting us keep them until January since they’re already planted. I built mine of redwood because I wanted them to last. Ironic, huh? So far I’ve put about $1200 into the plot, and that’s not even counting the seeds and transplants. I may still have to replace my fence and fence posts with plastic, and my redwood beds with plastic border edging. But my little garden is up and growing. I have poundage envy from those of you who are growing 500-1,000 lbs of produce. My goal for this year is 500 lbs from the community and home gardens combined. That’s counting fruit from the trees too. 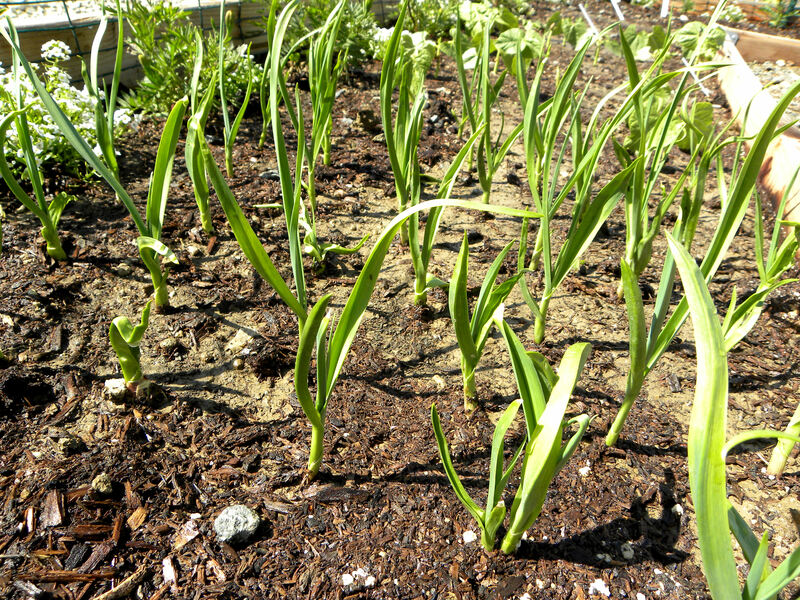 I have 41 California Giant Garlic growing at the community garden. That should keep vampires away. Haven't seen any werewolves either. 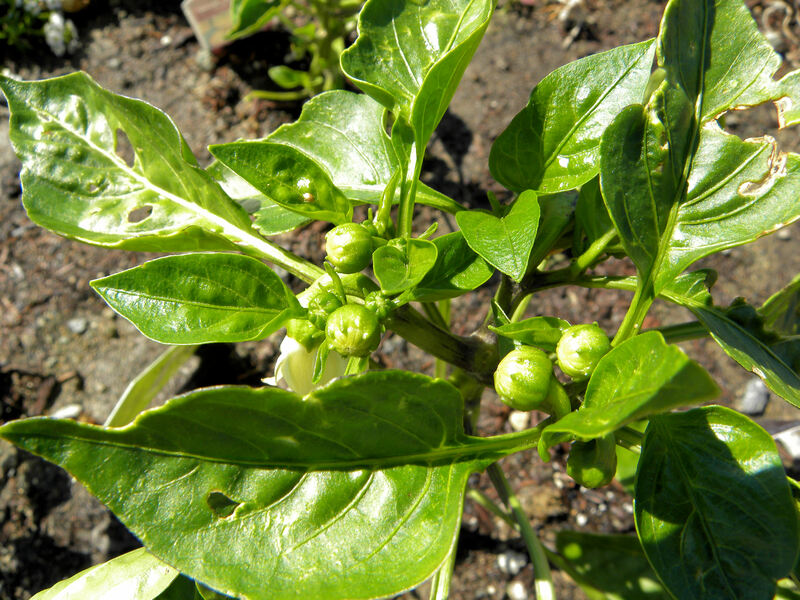 I'm growing five different colors of bell peppers. My summer squash seeds were old, so I planted twice as many as I wanted. They all came up, and God help me, I can't bear to thin them out. I have 15 summer squash plants. That should go a long way toward achieving my 500 lb goal. Only about half of the bush wax beans came up, but I should still get a half decent crop. 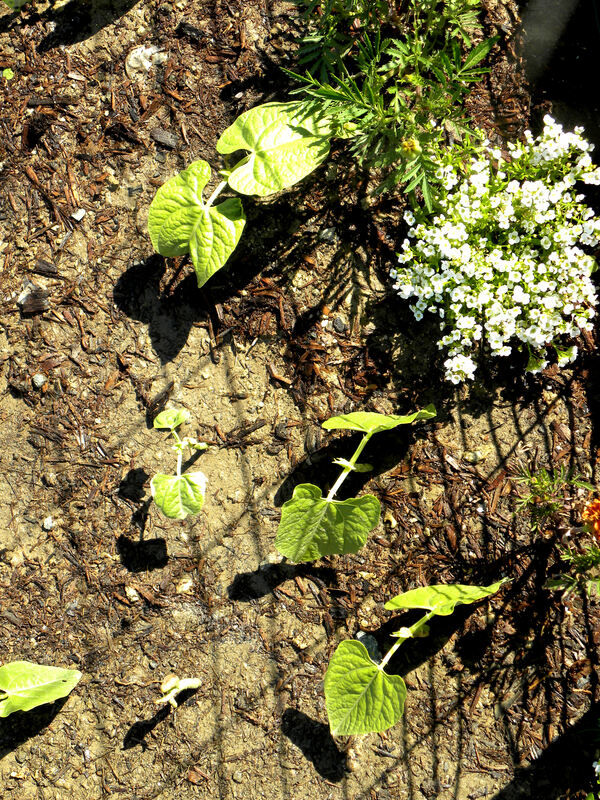 I'm also growing Cherokee Trail of Tears pole beans at the Comm. Garden and both Blue Lake and Kentucky Blue pole beans at home. I'll plant the scarlet runner beans later, letting them twine up the sunflowers. The bunnies ate my first two Japanese long eggplant, so I bought two more. 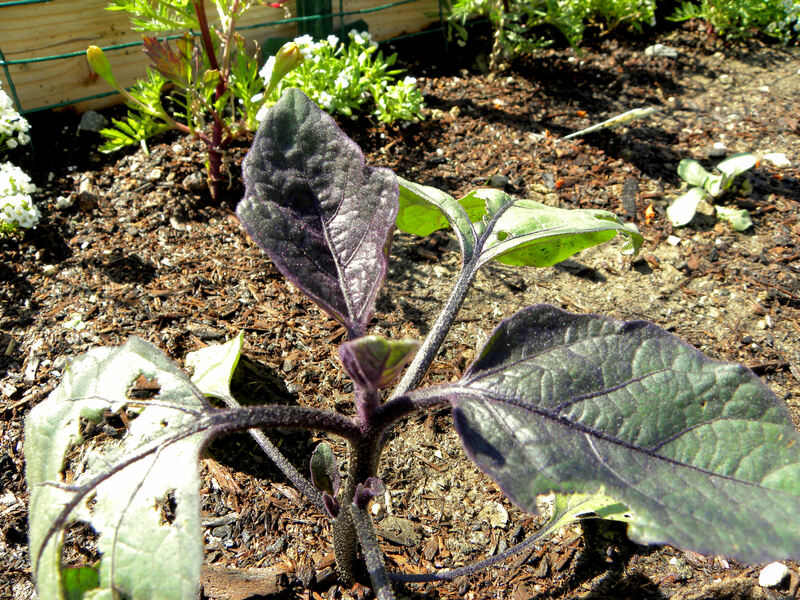 When I went back to the garden, I discovered that the eaten eggplants had resprouted from the roots. So I have twice as many eggplants as I had planned. Tomato Row has Arkansas Traveler (a new variety for me), several Romas, Better Boy, Brandywine, Black Prince, Black Krim and Black from Tula (another new variety for me). 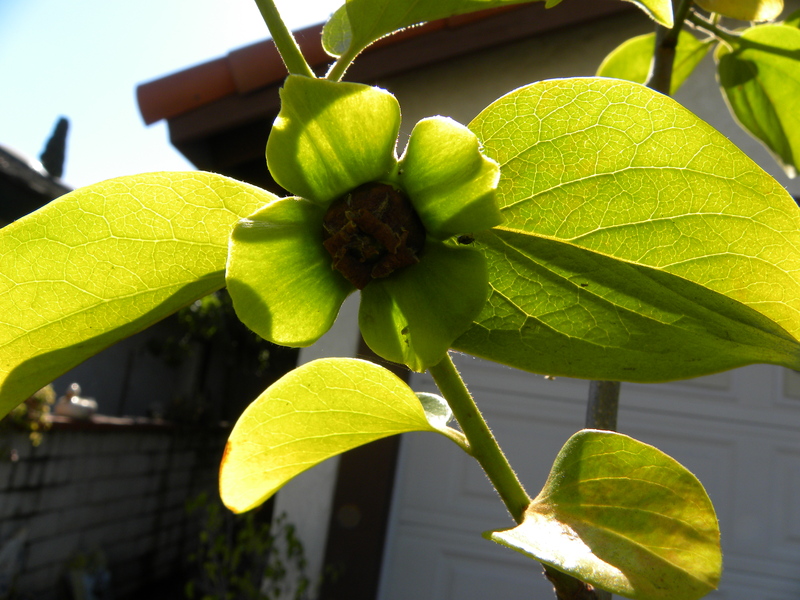 My new Fuyu Persimmon tree at home had one flower on it. It seems to have been fertilized, so I may get my first home-grown persimmon this fall. I've harvested my first tomatoes already! These are Sweet 100s, a new variety for me. I can't believe all the tomatoes on that plant. I'm glad I only have one plant of that variety. I also have an Early Girl at home, and quite a few mystery tomatoes that came up from the compost pile. 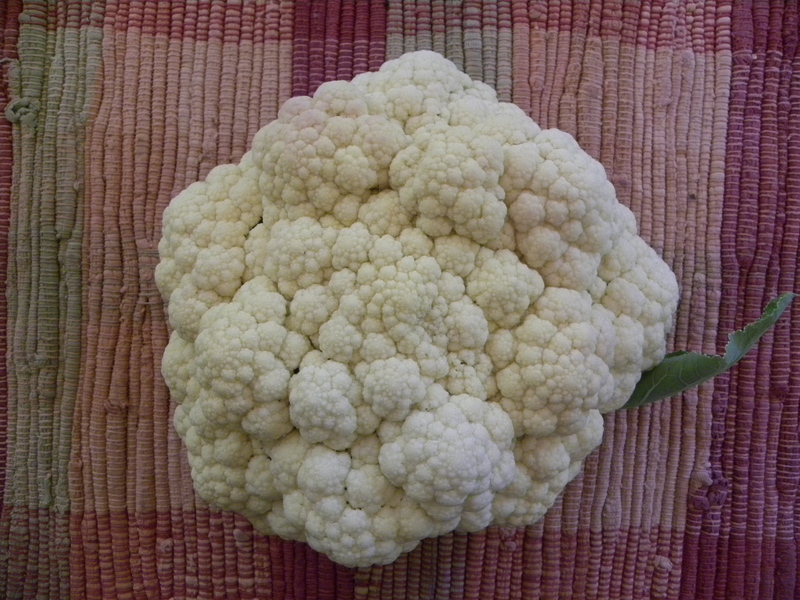 Just to show that my first cauliflower wasn't a fluke, here is a second perfect head. This one weighed in at 1 lb 14 oz. 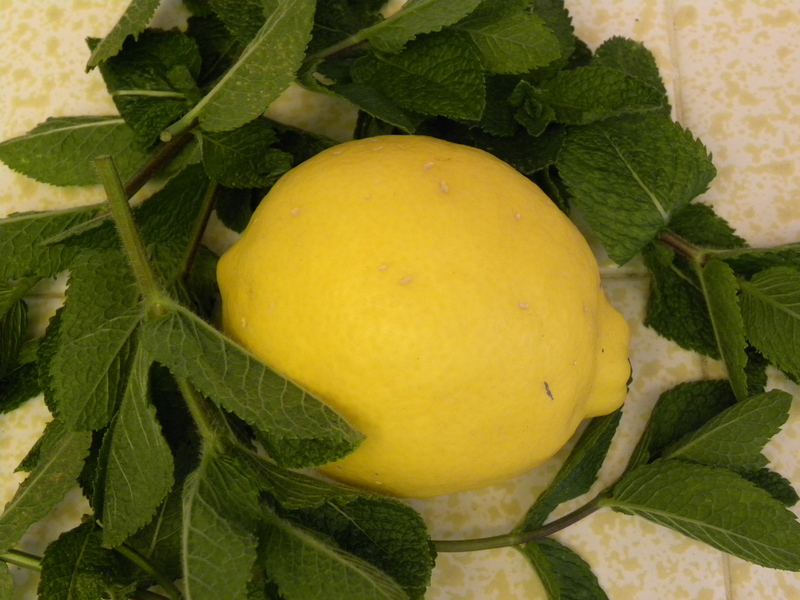 The mint is growing rampant and I still have several Meyer lemons, so I made some tabbouli. 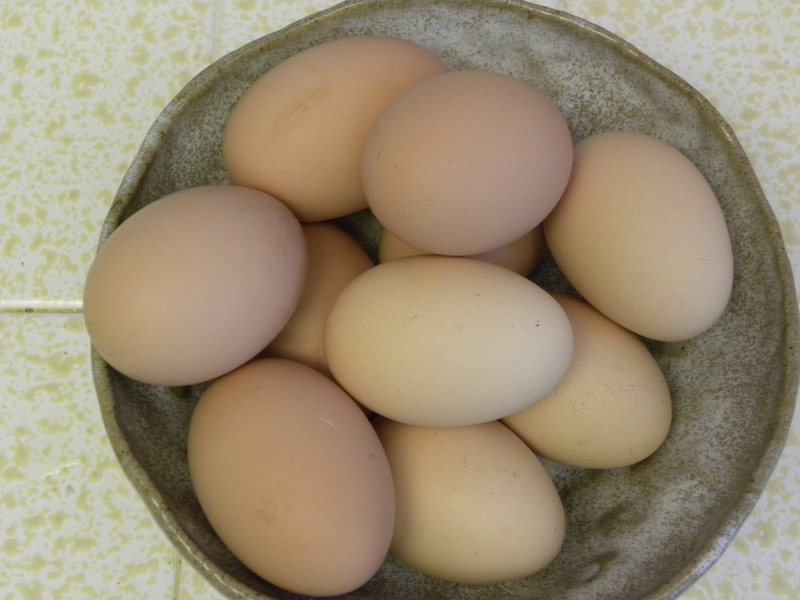 Henrietta and Chicken Little are really earning their keep, giving us 10-13 eggs a week now. Also at the community garden I’m growing winter squash (mini red kuri, mini green kuri, and mini blue hubbard), Amish pie pumpkins, radishes, mizuna (a delicious Japanese mustard green), rainbow chard, 40 onions (about 20 each of Southern Belle and Texas Sweet), moon and stars watermelon, Crenshaw melons, and both bicolor and white corn. The corn, Crenshaw melons, watermelon, three varieties of winter squash and Amish pie pumpkins are all new varieties for me. I don’t have space in my home garden for those veggies, so I’m excited to see if I get anything from those plants or not. Our community garden is really close to the ocean, so it may be too cool for some of those crops. Time will tell. That’s a quick and dirty recap of my new community garden and urban home farmlet. Happy gardening to you all. 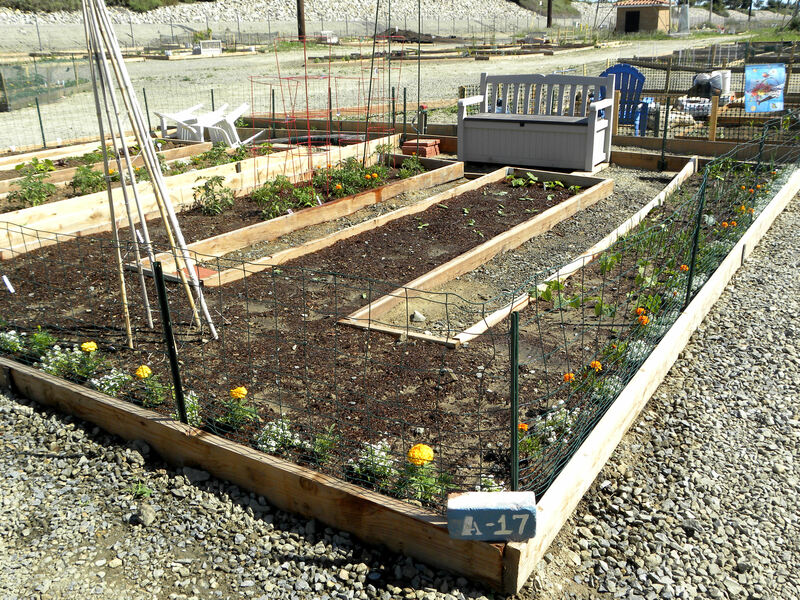 This entry was posted in Uncategorized and tagged Huntington Beach Community Garden, vegetable garden. Bookmark the permalink. 8 Responses to My plot at the new community garden is planted! Your plot is looking is fabulous, and quite an assortment! What a drag though that you can’t have raised beds. Why not? Trip hazard? So unfortunate. Regardless, it does look like mid summer could be rather amusing with that many summer squash planted, maybe the bunnies will help you out with that too, although I hope not. 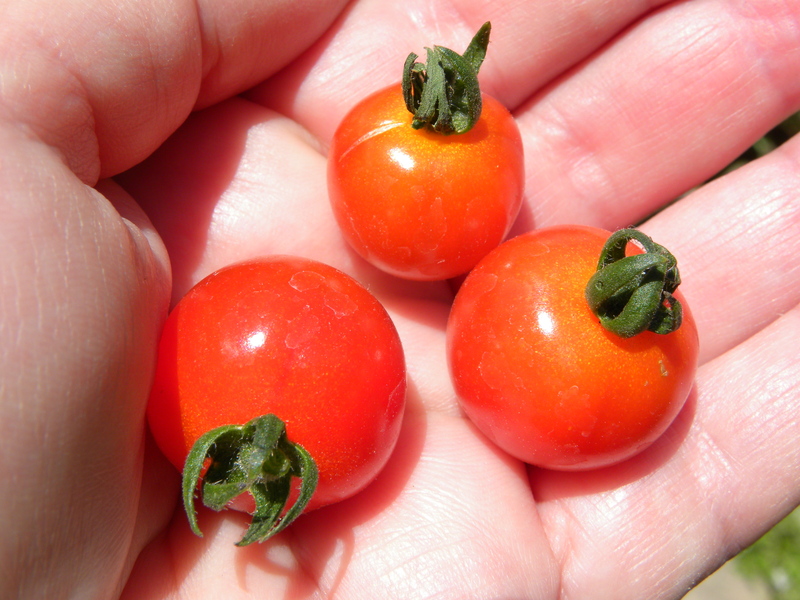 I seriously can’t believe you’ve harvested tomatoes already…mine are only just beginning to think about blooming! Clare, see my comment to Daphne about the raised beds. It really is idiotic. I know about the summer squash. I’m insane. 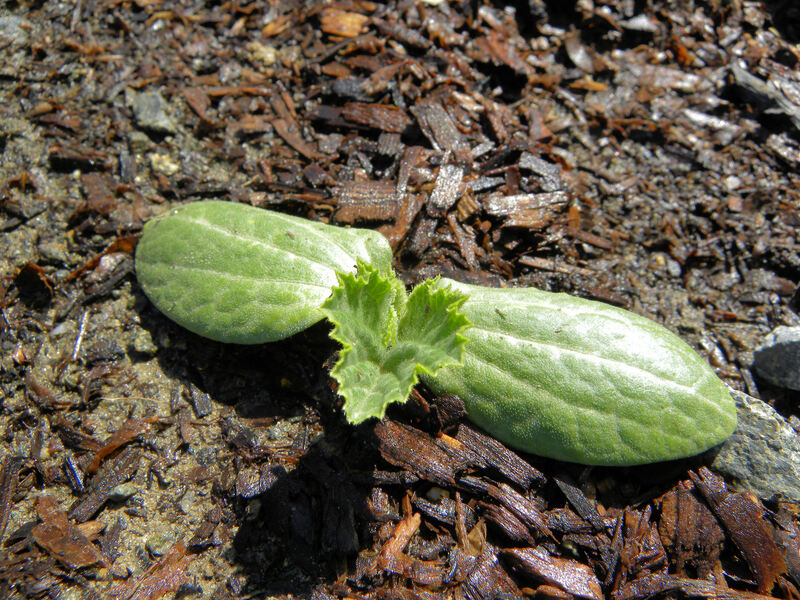 Yet another one sprouted, so I gave away a Lebanese and Gold Rush zucchini. I still have 14 summer squash. Just shoot me now. I will have no friends left by August. They’ll all be hiding from me, worried that I’ll drop another load of squash on them. Your plot looks wonderful. But what is their reasoning for not having raised beds? I can see them not wanting a mass of wire under their wires, but raised beds? You could probably get away with raised beds a la Jeavons though. With no real sides would they complain? And if you can’t have vinyl covered wire could you rip the redwood boards and use them to make tomato cages? At least they aren’t complaining about your bench. Daphne, their logic defies logic. The bench is larger than anything and many of us have them. I guess they can be pushed out of the way easily. Their reason for no raised beds is that in the unlikely event of a power line coming down, they have to get their trucks under the lines to restring. That would crush all of our gardens of course. They said that their trucks need a level surface. But they were OK with our outer bed borders, which are the same height and thickness of my raised beds. We’re hoping that logic will prevail and that they will change their minds about the raised beds. They’re so pretty. I don’t know what raised beds a la Jeavons are. Nice plot and great selection of veggies planted. Sorry about the raised beds, redwood here would cost a fortune. I question why you would be planting beets? Beets do not like summer heat, best to plant in the fall or very early spring. We have two beets coming up missed from last springs crop. Randy, beets can be planted in all months here (coastal southern California) except July, August and September. May and June here are always cool and cloudy, so they should do fine. We call it May Mist and June Gloom. It doesn’t heat up until late July, if at all. Our community garden is only a few blocks from the ocean, so we may not have enough summer heat to grow corn or watermelon. We’ll see. 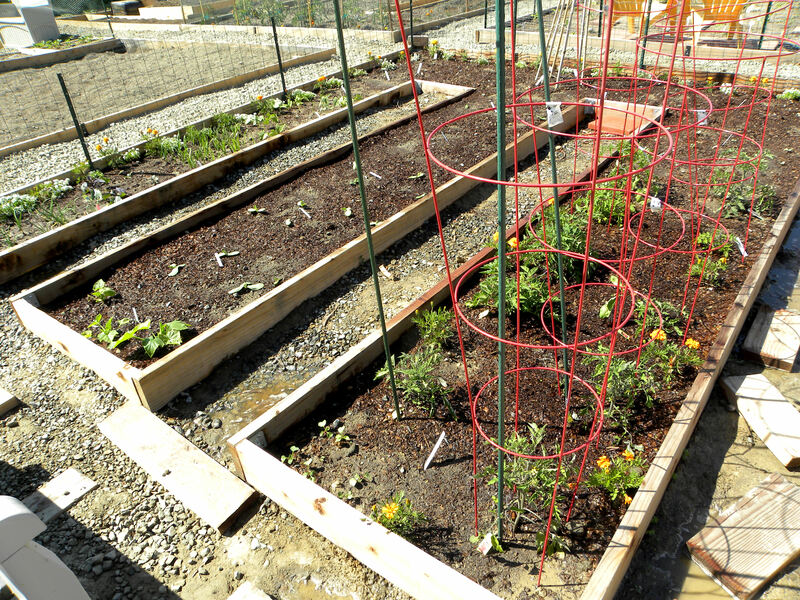 They are raised beds without any material to hold up the sides. It is all just dirt. They may well be fine with that. It’s not quite as neat as having wooden sides, but it does perform the same function. Daphne, I don’t think that would work for my plot at the community garden because of all the rocks in the path. I only rototilled and amended the area inside the beds to save money. (Like spending over $1200 on a 14 ft x 20 ft plot is saving money.) The pathways are still the original gravel parking lot and I don’t want to mix the gravel back in after having paid to have the rocks sifted out.